Leftovers for lunch. The indeterminate brown bits are aubergine. My June store cupboard challenge got off to a good start, with a determined effort to use up some leftovers languishing in the fridge. When making a meal plan, I reckon it makes sense to start by using up the stuff that is likely to go off fastest. This basically means fresh food in the fridge: fruit and veg, open packets of meat or fish, dairy products like cheese, milk and yogurt, plus bread and any leftovers from meals past. My default lunch is ham and soft cheese on a sandwich thin, with some cucumber and tomato. If it runs out, I buy more on autopilot. Today, inspired by the challenge, I decided to tackle the leftovers and go for something slightly more interesting. I know it’s frustrating to read about leftovers where the cook just happens to have half a guinea fowl and some caviar hanging around, rather than a bendy carrot, mouldy lemon and the remains of yesterday’s bolognese, but I really did have some roasted aubergine looking unattractive in a plastic tub. I had great intentions about making an aubergine dip business when some friends came round, but then lost my nerve at the last minute. So today I faced up to the aubergine, and went all North London trendy by making ‘Burnt Aubergine with Yellow Pepper and Red Onion’ from Ottolenghi: The Cookbook. The real bonus was that it also used up half a red pepper and half a yellow pepper left from a stir fry, and the little box of red onion I chopped up by accident, when I was meant to be cutting wedges for roasted vegetables. Luckily I had all the other ingredients in stock too: a few cherry tomatoes, part of a pack of flat leaf parsley, ground cumin and some cider vinegar that I only normally use for making cranberry sauce at Christmas. 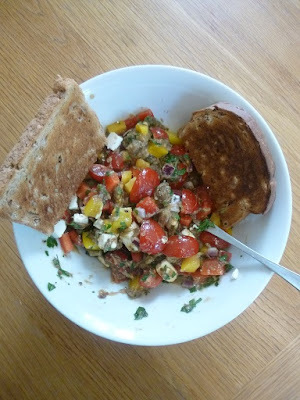 The recipe suggests adding sunflower or nut oil, so I even used some walnut oil from the back of the cupboard. (I have no idea why I possess walnut oil. Given the bottle has a best before date of 2010, the rationale is long gone). I chucked some Aldi equivalent feta on top for protein, added a slice of wholemeal bread and enjoyed a distinctly more interesting and virtuous lunch than normal. For the evening meal, I wanted to use up some mashed potato left after making fish pie at the weekend, and cook something the whole family could eat. The stock take reminded me of a tin of red salmon bought on offer three months ago, so I decided on fish cakes. Fishcakes for the children. They complained, but they ate them. The recipe is actually based on I Can Cook, the CBeebies children’s cookery programme hosted by the unflinchingly cheerful Katy: Magic Mini Fishcakes. However, I always pad out the tinned red salmon with mashed potato, and leave out the parsley and spring onions so my children don’t recoil in horror at the green bits. All you do is mix together equal amounts of mashed potato and tinned salmon and (gourmets look away now) add a splurge of tomato ketchup. Divide it up into balls and squish them into patties – I ended up with about 350g mix, which made 5 fishcakes. I retrieved a crust of bread from the freezer, grated it up to make breadcrumbs, then rolled the patties in breadcrumbs and bunged them on a baking sheet. I used a teaspoon to drizzle a bit of olive oil over the top, then put them in a hot oven. The original recipe says they only take 10 to 15 minutes but this is a lie. Allow 20 to 25 minutes really, if you want them to look a bit brown and crispy on top. This gives you time to make any veg or salad you’re intending to serve them with. Red salmon fishcake with mango chutney, rice and crunchy salad. 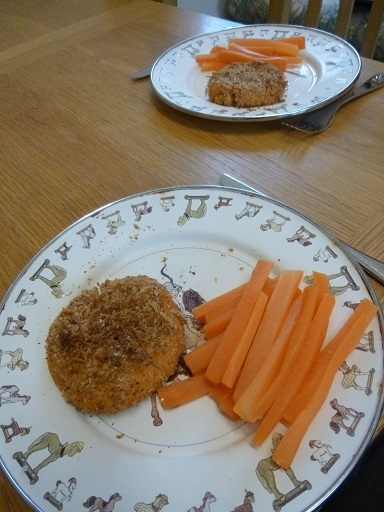 The children ate their fishcakes with steamed carrot sticks, while my husband and I ate them later on with rice, mango chutney and salad. These fishcakes taste a bit sweet, which I think goes well with the chutney. 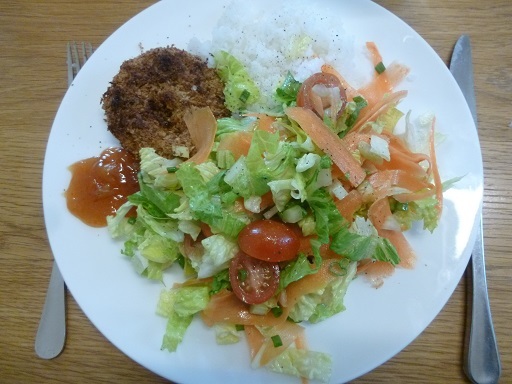 My standard salad consists of tomato, cucumber and lettuce if you’re lucky, whereas today we didn’t have any cucumber, so I added crunch with carrot, spring onion and celery instead, and even made some salad dressing. I took a picture of my version. My husband got an extra fish cake and loads more rice to bulk out his meal. I also made fruit smoothies for the children, which is a great way to smuggle fruit into them and use up fruit that’s a bit past its best. In this case it was a few slightly squidgy strawberries, a browning banana and the remains of a mango, all whizzed up with milk. Throw in a couple of straws from the pound shop and you could almost qualify for mother of the year. End result: clean plates all round, and a feeling of smug self-satisfaction from using up a load of leftovers.